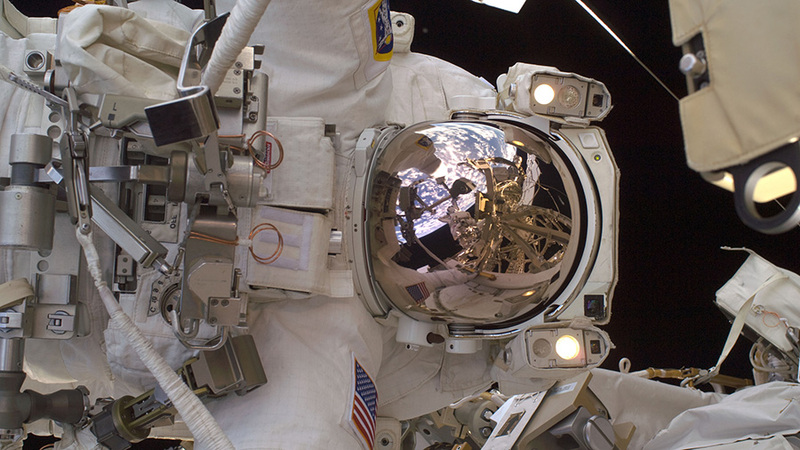 Astronaut Ricky Arnold is pictured in March 2009 during a spacewalk at the space station when he was a member of the STS-119 crew aboard space shuttle Discovery. Expedition 55 Flight Engineers Drew Feustel and Ricky Arnold of NASA switched their spacesuits to battery power at 9:33 a.m. EDT, signifying the official start of today’s planned six-and-a-half-hour spacewalk outside the International Space Station. Feustel is wearing the suit bearing the red stripes, and Arnold’s suit has no stripes. Views from a camera on Feustel’s helmet are designated with the number 17, and Arnold’s is labeled with the number 18. Feustel is designated extravehicular crew member 1 (EV1) for this spacewalk, the seventh of his career. Arnold, embarking on his third spacewalk, is extravehicular crew member 2 (EV2). Once outside the airlock, Feustel’s first task will be to install the wireless communications antenna on the Tranquility module, while Arnold will begin the process of removing a set of hoses from the cooling system. Once they have completed those activities, they will work together to replace a camera system on the port truss. I’M VERY HAPPY TO SEE YOUR SPACE WALK AND GOD BLESS YOU ALL.